So we had a list of things that needed doing around the Den before we could put it on the market. They included the usual ‘curb appeal’ things, clearing out trash-formerly-known-as-landscaping from the front yard, picking up clutter, putting down playground bark and replacing worn out carpets and fixtures. Refinishing the front door. Uh, the list…kinda goes on. There’s a level of ‘deferred maintenance’ going on here that gets a little embarrassing when I list it all out. We have no time to deal with these things right now, and no funds available to do it with even if we did have the time. Which, as I said, we don’t. Meanwhile, out in the real world, we’ve got a major problem. If you drive down any street in town right now, you will see a ‘for sale’ sign in front of about every fourth or fifth house. Usually, we have roughly 30, maybe as many as 50, properties for sale; right now, there are 167 on the MLS alone, which doesn’t count any of the ‘for sale by owner’ or Help-U-Sell deals. Foreclosures are high, as are short sales and plain old fire sales. Prices are falling, falling, falling. A year ago, our model was selling for $575,000; today, we’d be lucky to get $525,000. In other words – we aren’t likely to sell for what we’d ask, and we wouldn’t get a sale anytime soon. So we’re backing away from selling this spring, which is a tremendous relief to me thanks all the same. I was starting to lose hair over all the stuff we needed to do, and getting funding for it on such short terms was a nightmare. Instead, we’re battening down the hatches and preparing to weather yet another storm in the Den – this will be the third housing storm that has blown through this place since we moved here nine years ago. While the storm blows around us, we’re going to be taking care of all those things we should have been taking care of as they came up, but, uh, didn’t. We’re doing a remodeling project. A pretty intense one. 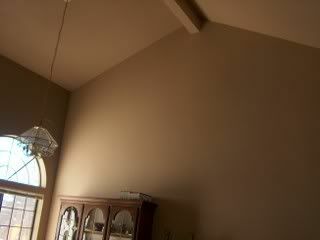 One of the options the original builder proffered was replacing this vaulted ceiling with a second master suite. The original buyers of this house weren’t interested – they were DINKs, no pets, very into entertaining and gracious living (they put in white carpet, for carp’s sake – WHITE CARPET!). They didn’t want to pay the extra $20,000 for space they didn’t need. And if I were they, I’d agree. However, not being DINKs, we have mourned the non-existence of that living space ever since Boo Bug came along. …which as you can see is used to store my spinning wheel, a piece of my husband’s artwork, any toys the Denizens fling thither from the hallway, and dust. We’re replacing that with a student / tech center and a hallway which leads to a loft on one side and the new mini-master suite on the other. The mini-master will have a walk-in closet and a small but full bathroom. We’re filling in a corner currently occupied by a spa we never use to create a walk-in pantry and small office space for me downstairs (actually, I think the pantry may be bigger than the ‘office space’ – but I’m good with that), and a larger master bathroom upstairs. This weekend we’re doing a knit-along for the Knitting4Children group. We’re doing a 5 Hour Baby Sweater, and by golly, I’ve found it really does take about 5 hours. My favorite version of the pattern is at Bev’s Country Cottage. And also, I am having a terrible time not cheating and casting on a little early. Wow. You're brave. 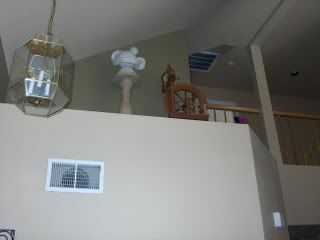 Although I have to say that I kinda miss some of the DIY stuff since we moved...Hubby doesn't, though. Go figure. The changes all sound wonderful, though. Newsflash: Mother Tired! Film at 11! !